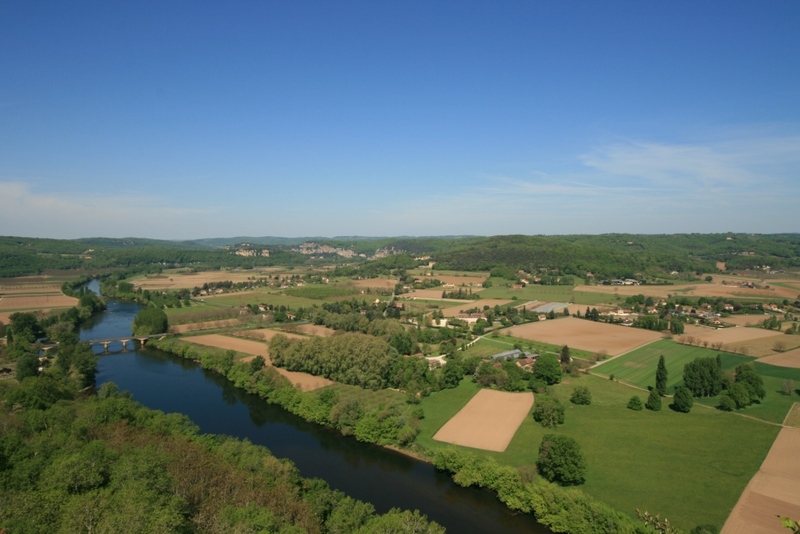 The village of Domme sits high above the Dordogne Valley, 150 metres above the Dordogne river which meanders peacefully below. There are many things to do and see in the village. Situated on an exceptional site, at the crossroads of main regional routes, a Feudal castle marked the spot until 1280. The King of France, Philippe the Bold had a fortified village constructed in 1280, following his campaign along the Dordogne river, asserting his strength over the wealthy lords of the area. Domme obtained the privilege of minting its own currency. 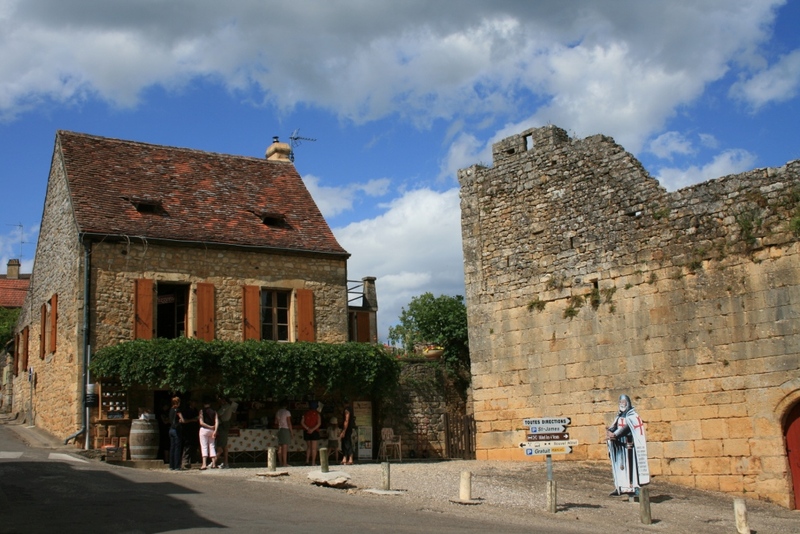 During the Hundred Years’ War, the bastide was coveted by the English who first took the town in 1347, the town repeatedly changed rulers throughout the war until 1437 when it finally fell under French rule again. The most severe time without doubt was during the Religious wars when it was taken by Huguenots under the command of the famous Protestant captain, Geoffroy de Vivans, A majority of its medieval buildings were destroyed during this time. 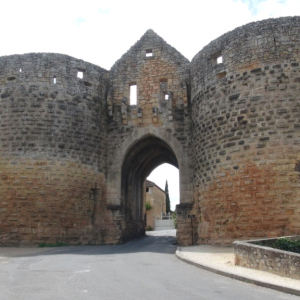 Domme was built according to the strict architectural principles laid down for fortified bastide towns with its streets intersecting at right-angles. Its general form is trapeze shaped, thus adapting to the lay of the land. With its flower-filled lanes and old houses honey-coloured stones and brown roof tiles, the town of Domme has preserved all of its charm. Inside the town numerous monuments remain. The city walls remain well preserved with 3 of the old fortified portes (gates) still standing. The Portes des Bos, the Portes des Lacombe and the most famous the Porte des Tours where the Knight Templars were imprisoned from 1307 to 1318 during the trial against them. In the tours there remains hundreds of Templar graffiti that still bear witness to this time. The Templars used a code system involving series of geometric figures: the octagon represented the Grail, the triangle surmounted by a cross represented Golgatha, the square represented the Temple, and the circle represented the imprisonment. Read more about this in the things to do and see section of this page. The entire town in gorgeous and there are many things to see and do in Domme, however some remarkable buildings are the Town Hall, the 15th century, the Governors house and the Paul Reclus museum.The 17th century covered market takes pride of place in Halle de Domme. In the centre of the market is the entrance to the magnificent Domme caves, formerly used as a hiding place by the towns people. This grottte is the largest natural cave in the Périgord Noir, featuring colonnades, stalactites and stalagmites. Read more about this in the things to do and see section of this page. Just above the Place de la Halle is the Belvedere de la Barre, a great viewpoint and the start of the Promenade des Falaises – a short walk leading to a public park. 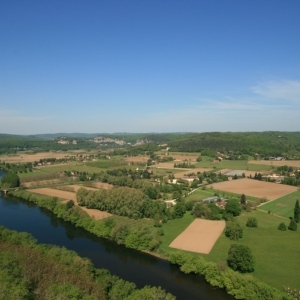 The walk is all high up above the Dordogne river and so the views are stunning. Parts of the walk are bordered by remains of the fortified walls that surrounded parts of Domme. The Jardin Public at the end is a good place for a picnic. A little further along is the Moulin du Roy. Read more about this in the things to do and see section of this page. Jardin Public just a short walk down Promenade des Falaises from Belvedere de la Barre. 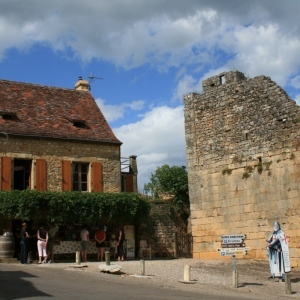 Visit the tourist office and get info on more things to see and do in Domme and the Dordogne.